Habit: Perennial herb, subshrub, (< 1)1--2(3) m. Leaf: 4--8 cm; blade widely lanceolate, base tapered; teeth minute, rounded; hairs dense, minute, simple, appressed. Inflorescence: clusters few-flowered, in +- spike-like clusters, these in +- raceme-like, interrupted panicles; bracts < to > calyx, lance-linear, recurved. 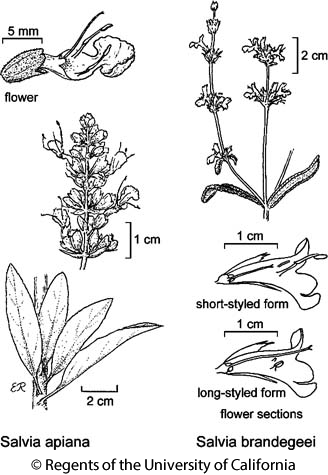 Flower: calyx 8--10 mm, lobes barely or not spine-tipped, upper lip entire; corolla tube 12--22 mm, white and lavender, upper lip < 2 mm, lower lip 4--5 mm, upcurved, blocking throat; stamens, style exserted. Fruit: 2.5--3 mm, shiny, light brown. Chromosomes: 2n=30. Ecology: Dry slopes, coastal-sage scrub, chaparral, yellow-pine forest; Elevation: generally < 1500 m. Bioregional Distribution: s SCoRO, SCo, TR, PR, w edge D; Distribution Outside California: Baja California. Flowering Time: Apr--Aug Note: If recognized taxonomically, plants with condensed panicles assignable to Salvia apiana var. compacta Munz. Citation for this treatment: Deborah Engle Averett 2012, Salvia apiana, in Jepson Flora Project (eds.) Jepson eFlora, http://ucjeps.berkeley.edu/eflora/eflora_display.php?tid=43038, accessed on April 21, 2019.
s SCoRO, SCo, TR, PR, w edge D; Markers link to CCH specimen records. Yellow markers indicate records that may provide evidence for eFlora range revision or may have georeferencing or identification issues. Purple markers indicate specimens collected from a garden, greenhouse, or other non-wild location.